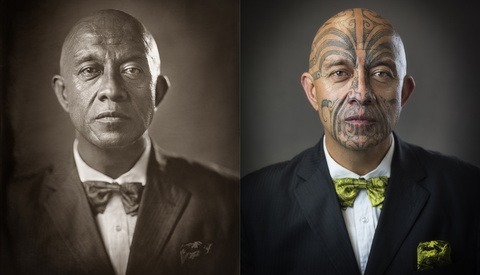 I have been absolutely fascinated by wetplate processes for a while now: I find the medium absolutely unlike anything else in the world of art and photography, and the one-of-a-kind results from this hand-crafted process are simply beautiful. 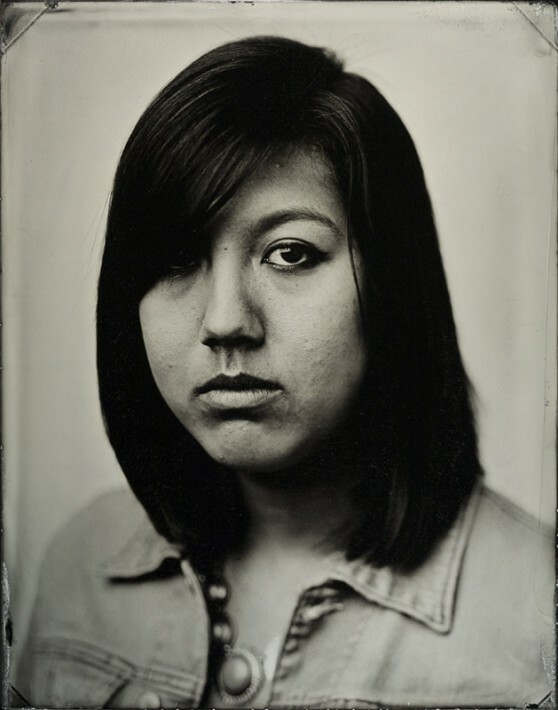 When I learned that there was a studio in San Francisco that specialized in taking collodion (tintypes, specifically) portraits of clients, I absolutely had to have one done. What originally sparked my interest in these vintage processes was Ian Ruhter's Silver & Light project. Seeing him at work to create an image is, to me, more like watching an expert painter or sculptor create a masterpiece. 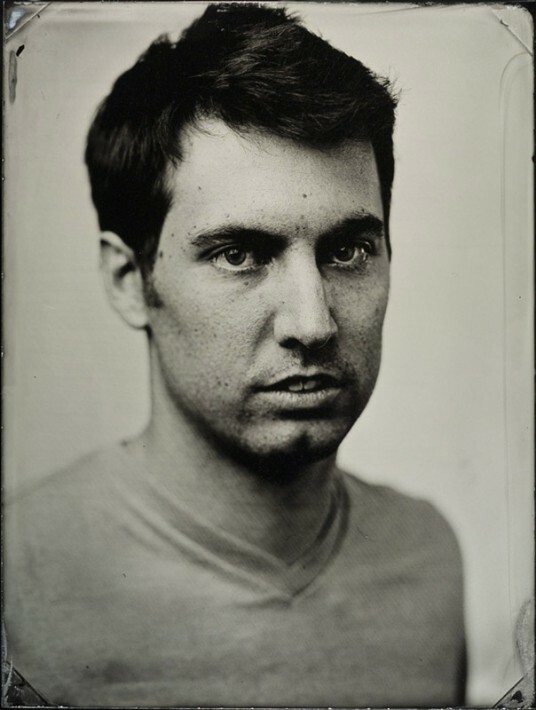 Ian, for those who aren't aware, converted a box truck into a camera that shoots single wet-plate images. Each one costs him over $500 to make, and he has to physically back his truck up to the location to frame his shots. His work is absolutely incredible and has made me rethink so much of what I thought photography was. I know that all sounds dramatic, but bare with me. Collodion techniques turn photography from a disposable digital commodity to a real tangible art form. Rather than creating an infinitely reproducible negative or digital file, the end result of the wet plate process is a single direct positive. Sure, you can take a picture of it, but it will not retain any of the depth, character, or luminosity of the original. It's a unique one-off: there will never be an identical to the plate. Further, it is direct physical evidence that I was there. The light bouncing off of my face is responsible for causing a chemical reaction on a piece of metal, which I can now hold in my hand. Have I geeked out enough yet? I think that's enough for now, so let's get down to the nitty gritty. 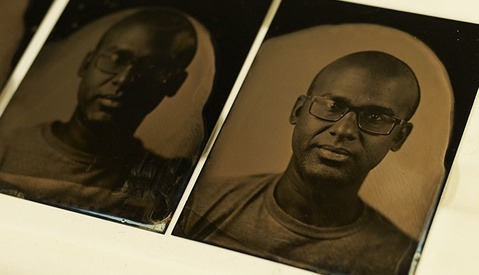 So how does all this tintype portrait brouhaha work? The idea behind PhotoBoothSF is that anyone can walk in off of the street and get their portrait taken in one of a few different ways. 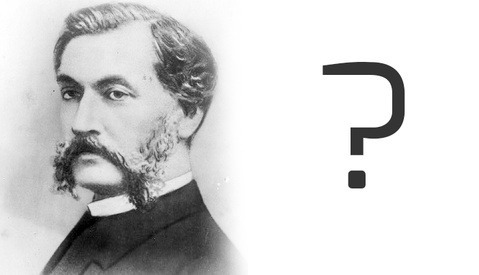 They have polaroids, tintypes, daguerreotypes, and so on and so forth, but tintypes are the most popular. While the walk-in idea is nice, in reality they are so busy that they strongly encourage you to book an appointment. In fact, people have flown from all over the world JUST to have their portrait taken here. I was told by an employee that someone had recently flown from Singapore just to have a tintype taken of them at the studio. Another had just flown in from North Carolina. Seeing as I was driving six hours from Los Angeles and I damn well didn't want to screw it up, I was sure to make an appointment ahead of time. It's quick and easy and all handled through their website. Once you arrive, you can check in and hang around for a bit while they prepare the plates and get the equipment set up. Hanging out here is highly recommended for any camera enthusiast, as the walls are covered with exhibits from different mediums, there are cameras, old and new, scattered throughout. It's almost a sort of museum/shop combo of lomography equipment. Very neat. I was with a friend of mine who was equally interested in all this stuff, so the 10-15 minutes of waiting flew by. 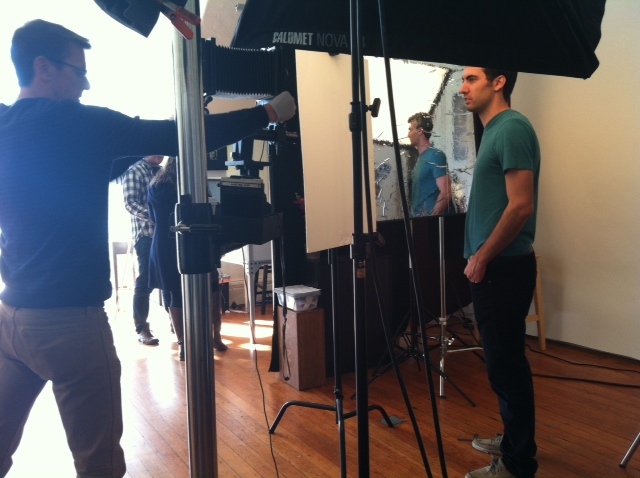 We were eventually greeted by the man behind the company, Michael Shindler, who would take our portraits. He explained a bit about the process and (thankfully) let me pepper him with questions for about 15 minutes before he and my friend had to more or less get me to shut up for long enough to get this thing done. He was eternally patient with me, which was awesome. The setup, I suppose, is relatively simple. A Sinar F1 is mounted on an expensive-looking support system and there are a few lights and reflectors scattered about. Michael got me into position, loaded up the plate that he had just readied in the darkroom, and told me to take a few deep breaths and close my eyes for a second to 'get it all out of my system.' Unlike digital, or even film, you only get one go at this. He posed me for a bit and once he settled on how he wanted me to look, asked me if I was ready. And pop. A quick burst of heat hit me from the light, which must have been set on some unholy power level to compensate for the 5x7 camera's small working aperture and the low sensitivity of the plate (I later learned that the ISO equivalent would be around .3! ), and like that, it was all over. Phew. A six hour drive and all my questions later, and we were done. Michael hurried off with the plates (myself and my friend's) and worked his magic behind closed doors. After a few anxious minutes, he returned with the two plates and placed them in a heated glass enclosure to let them dry. You can actually watch the plate come to life at this point - the change happens right in front of your eyes, and it's pretty remarkable. After a few minutes of drying, you're given the plates, but not before they snap a few shots that they'll send you via email so you'll have a digital copy. Apparently they don't scan well, so they shoot them with an old DLSR mounted over a lightbox type of thing. Once you get to hold the plates outside in the sunlight, the real magic of this medium becomes evident. The depth, clarity and 'physical' element all become immediately apparent. The plates have a certain depth to them - far removed from printing digital files on metal or using a silver halide paper. For me, the uninitiated - I was simply (and still am, every time I look at it) fascinated. I was so enamored, in fact, that I immediately went home and signed myself up for an alternative processes workshop - which would teach me how to shoot and develop both tintypes and ambrotypes (glass plates) at the Julia Dean Photo Workshops here in Los Angeles. I took the class last weekend and came home with about ten tintypes of my own, and I must say that the process is incredibly fun and rewarding. Talk about taking your time and spending thirty minutes to an hour to create one image! I loved every second of it and will certainly keep at it into the future. So if you ever find yourself in the San Francisco bay area, I highly recommend that you take a trip over to PhotoBoothSF, which is located in the Mission district, about 20 minutes from Downtown. Tintypes start at $60 and there are a number of packages available. You can walk in to have your picture taken, but reservations are highly recommended because of how busy it gets and the time it takes to create a shot. Truth be told, after all that, I'd happily have paid $100 for mine. It has sparked a new interest and fascination in vintage photography process that will probably be a creative outlet for a long time to come. Hopefully I don't end up shaving years off of my life from the chemicals involved, but at least it won't be from something boring like eating bags of Doritos all day. Oh yeah, and those shots? Check em out below. Both myself and my friend Andri, who kindly volunteered her face for this article. He didn't varnish them? Weird. He did - after they dried. Forgot to mention that. Do you know what varnish he used? And did he give any instructions on how to handle it while you waited for the varnish to cure? I'm going to go do this. Really really terrific stuff. Ian Ruhter is doing amazing work and I'm signing up for a collodion wetplate weekend here in Switzerland based on his videos. Your portrait looks great Mike. I live fairly near Photobooth, and I've always been amazed at the work they do there. I've never actually been inside, though, because every time I go by the place is just rotten with hipsters. Apparently they do some cool events, though, like a portfolio review and an instant camera photo walk. Very cool idea this studio is offering and cheap too! There's a photog here in Montreal who offers wet plate photography for 250$ for a 2x3 and Photobooth is offering shots starting at 60$ this is really good...Oh well one day maybe!